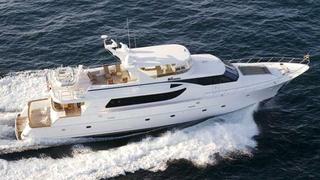 Bob Crow at Denison Yacht Sales tells me he's signed the 30m Northstar motor yacht Besame for sale. She accommodates six guests in three cabins: a master suite with a king bed, a queen guest stateroom, and a twin cabin, all ensuite. Besame exemplifies NorthStar’s attention to detail. Her open layout and large main saloon with formal dining area are perfect for entertaining. On deck, her cockpit is ideal for fishing, diving and water sports with easy access to the water. Intimate alfresco dining areas, great sun beds and lounge areas complete her versatile space. Lying in Fort Lauderdale, Besame is asking $4.45 million.